Present Status: Gone. Burned 1882. Building Materials/Description: Brick, $26,000. Similar to Panola County. J. J. E. Gibson (John Joseph Emmett Gibson), a native if Ireland, designed the Shelby County Courthouse using the castles of his homeland as inspiration. The Shelby County Courthouse Square is one square block at the heart of Center, in deep East Texas. The focus of the square is the 1885 Shelby County Courthouse, a somewhat naive version of Romanesque Revival design that was individually listed in the National Register in 1971. This nomination seeks to amend the original listing to include the entire courthouse square with its related historic buildings. The additional Contributing structures are the old jail (contemporaneous with the Courthouse) and the Classical Revival-style Records Building of 1913, both of which are informally sited adjacent to the Courthouse. Also on the site but considered Noncontributing are a fire station, a bandstand, a rest room building, and several monuments. The square is a level, slightly raised site with a cultivated lawn and a number of oak trees which shade the buildings. A geometric pattern of sidewalks crisscross the square between the buildings and a high curb bounds the landscaped square; these improvements are believed to date from the 1940s. The raised square is surrounded by a sidewalk and a wide swath of paved parking. On adjacent blocks surrounding the square are low-scale commercial buildings of the late 19th and early 20th centuries. 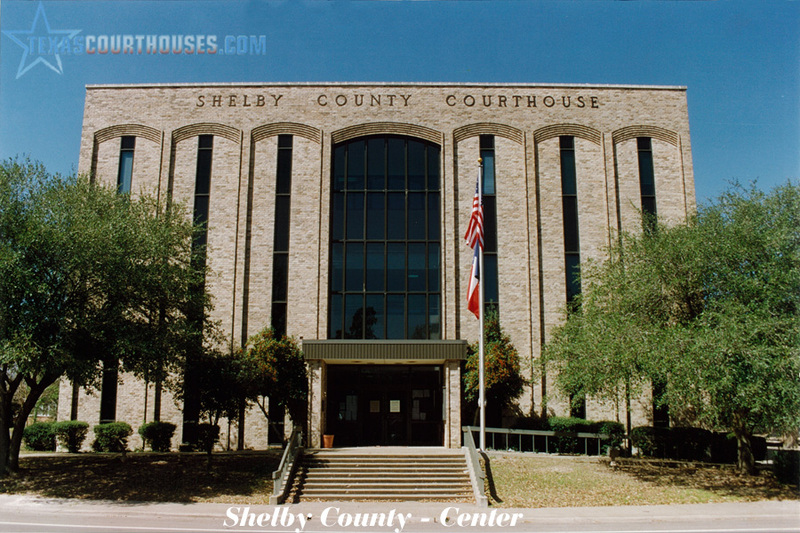 The Shelby County Courthouse is a two-story red brick gabled building in a romanticized Romanesque Revival style. The courthouse has a cruciform plan with a main east-west axis and two-story portico projections midpoint on the north and south facades. 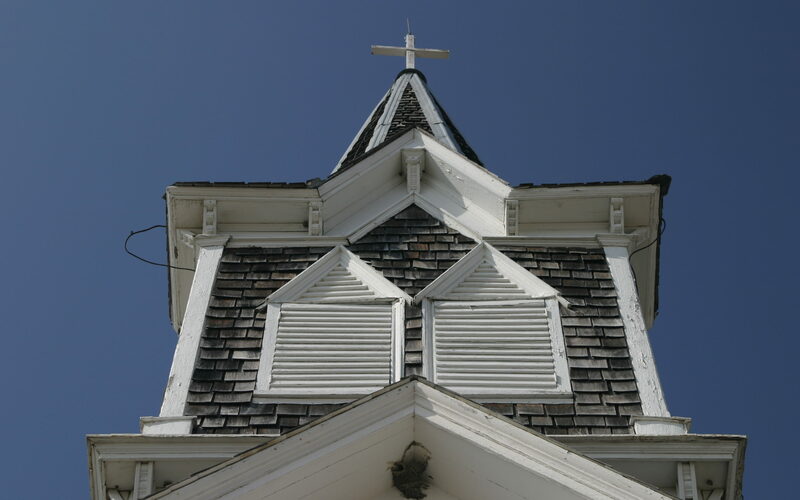 A frame cupola rises from the center of the main gable roof. The building is given its distinctive character by the detailed brickwork on the cornice, the stringcourses and the window hoods, and by a series of diminutive buttresses and turrets (or tourelles) which rise from the cornice. The courthouse has an entry in the middle of each facade but the primary approach is from the north. This front is divided into three bays delineated by its four prominent tourelles. The central bay is created by the projecting entry wing with a protected porch on the ground level and an enclosed space on the second floor. In the flanking bays decorative buttresses between the windows further segment the facade. The windows are tall and narrow with segmental arched tops recessed within roundhead arched openings. The parapeted gable ends of the building are similarly detailed, both with a one-story portico and, at the height of each gable, a pair of windows set in an ogee arch. The cupola that caps the building has a cross-gabled roof and paired arched vents on each side. County office occupy the first floor of the Courthouse and the courtroom fills the entire second floor. The courtroom is a large and lofty space, with exposed wooden trusses supporting the roof; these trusses in turn are supported by pendant posts with decorative corbels. A balustrade with ornamental newels distinguishes the bench and jury box from the audience. The 1885 Shelby County Jail echoes the Courthouse in a subdued version of its form and detail. It is a two-story gabled brick structure with two-story wings that were added on the east and west facades during the 1930s. The red brick walls of the building have been painted a beige color. The ridge line of the original building runs north south, and the wings have shed roofs which engage the walls of the original building just beneath the eaves. The north and south gable ends of the original building are bisected by external chimneys that are flanked by segmentally-arched doors and windows. Ornamentation is limited to a molded brick cornice with a single row of dentils, and segmental hood molds over the doors and windows. The added wings have a symmetrical arrangement of simple, double-hung windows. In plan the sheriff’s office occupied the south end of the first floor, with a cell at the northeast corner and a stair hall on the northwest. Partition walls now divide the Sheriff’s office into three separate rooms. The second floor contains the main block of cells. The Records Building on the southeast corner of the site is a two-story hipped-roof building with simple Classical Revival detailing. It is constructed in two colors of brick, echoing the materials of the earlier Courthouse and jail buildings. The main (north) facade is divided into three parts: a central entrance bay framed by pilasters supporting a pediment, and simple end bays set off by decorative brickwork at the corners giving the effect of quoins. The principal brick is yellowish beige in color and a reddish-brown brick was used for the base of the building, the pilasters, the “quoins” and the chimneys. The building has a central stair hall, with its pressed metal ceiling, flank by large open rooms. The other buildings on the square are considered Noncontributing because they have been constructed or significantly altered in the last 50 years. The 1933 fire station near the southwest corner of the square is 2 stories, constructed of beige brick, and has a hipped roof of asphalt shingles. the main elevation faces the street on the west side of the square. The building has been significantly altered by an addition on the north side of the building and the installation of a glass and aluminum door, a plate glass window, and modern overhead doors for the fire engine bays. At the northeast corner of the square is a two-story brick rest room building with a pyramidal roof built in 1945. East of the courthouse is a two-story brick bandstand with broad open windows on the second level and a pyramidal roof that echoes the design of the restroom building. The latter structure was originally built in 1923 but considerably altered in 1945. Both of these structures may become contributing elements to the site when they reach 50 years of age. On the north side of the square marking the main entrance to the Courthouse is a large street clock. It is believed to date from the early 20th century and has stood in downtown Center for most of the century; however, it was installed in its current spot in the 1980’s. Other landscape features such as the sidewalks and curbs are believed to date from the 1940’s. Set into the perimeter curbs are hitching rings that have been used on the square since the early century. The square also features two flagpoles and a number of monuments and historical markers set near the courthouse, all of which are considered Noncontributing. Contributing /Noncontributing. Shelby County Courthouse, 1885, building, center of Square, Contributing. County Records Building, 1913, building, southeast corner, Contributing. Fire Station, 1933(1960s), building, southwest corner, Noncontributing. Shelby County Jail, 1885(1931/39), building, northwest corner, Contributing. Restroom Building, 1945, building, northeast corner, Contributing. Bandstand/Men’s Restroom, 1923(1945), building, northeast corner, Contributing. Street Clock, c. 1900 (1980s), object, north side, Noncontributing. Hitching Rings, c. 1900(1940s), object, perimeter, Noncontributing. Historical Marker, 1969, object, beside Courthouse, Noncontributing. World Wars Memorial, 1950s, object, beside Courthouse, Noncontributing. Vietnam War Memorial, 1988, object, beside Courthouse, Noncontributing. The Shelby County Courthouse Square is significant as a well preserved Texas courthouse square, typical in its relationship to the town but unusual in its assemblage of a number of public buildings on the block with the Courthouse. The principal buildings were constructed between 1885 and 1913, with ancillary buildings dating through 1945. The principal buildings of the Courthouse, Jail and Records Building embody distinctive architectural influences in an atypical courthouse square design, therefore, the property is nominated under Criterion C in the area of architecture. As the governmental center of Shelby County for the past century, the property is nominated under Criterion A in the are of Politics & Government for its association with events significant in local history. Shelby County was created in 1836 by the newly independent Republic of Texas. At that time the county seat was located in Shelbyville which was the largest community, having been occupied since 1824 by settlers from Tennessee. In 1866 the citizens of Shelby County voted to move the county seat from Shelbyville, in the eastern part of the county, to a more central location. The county records were moved seven miles to the area around White Cottage, which consisted of a post office founded in 1848. Because of its central location, the new county seat was named Center. The town was surveyed and platted in 1869, and a large block at the center of town was reserved for the courthouse. The commissioners of erected a wood-frame courthouse and jail. These rudimentary structures served the county until 1882, when the courthouse burned to the ground. The commissioners of Shelby County determined to build a new brick courthouse and to replace the old wooden jail with a new brick one while they were at it. The 1880’s were an active era of courthouse building across Texas; in 1881 the Texas Legislature passed an act which enabled counties to sell bonds to finance courthouses. This allowed small, barely established communities to build to the level of their pride and aspirations rather than their limited financial means. This resulted in the many large revival style courthouses of the late 19th century in Texas, often designed by prominent architects of the time. The 1880s were the heyday of the French Second Empire style in Texas as practiced by architects as Frederick and Oscar Ruffini (Blanco, Concho, Hays, Hopkin, Navarro, and Williamson county courthouses) J.E. Flanders (Baylor, Dallas, Nolan, and Shackelford county courthouses), and W.C. Dodson (Anderson, Fannin, Hill, Hood, and Parker county courthouses). Shelby County broke from this pattern to the extent that it chose to build a relatively modest courthouse designed by a local builder. At least three plans for the courthouse were presented to the county commissioners and a design by local builder and brickmaker J.J.E. Gibson was ultimately selected. In addition to winning the commission for the Courthouse design, Gibson was also appointed to a committee to select a location and devise a plan for the county jail to be built simultaneously. Ultimately he won the bid to build the Courthouse and oversaw construction of the jail, so the complete design of the courthouse complex can fairly be attributed to Gibson. John Joseph Emmett Gibson was born in Ireland in 1849 and grew up in Dublin. Apparently he had some experience working in the building trades before coming to America in 1866, at age seventeen. He worked for a while in St. Louis, perhaps picking up the technology of brickmaking which he later utilized in Texas. Gibson first moved to Panola County, Texas, (just north of Shelby County) where he married, but he finally settled in Center. He opened a brick factory on the northeast side of town, just beyond the Santa Fe railroad tracks, and his kilns provided the material for the earliest brick buildings in the town and probably in the county. Although it appears unlikely that Gibson had any formal design training, he served the community as both architect and master builder. Gibson provided a series of drawings for the Shelly County Courthouse, suggesting that he was versed in the professional practice of architecture. Local tradition has long held that Gibson copied the design for the Shelby County Courthouse from a castle in his native Ireland. While there is no basis to this story, it points out the essentially romantic character of his design. Victorian tastes ran toward eclectic architectural concoctions that suggested romantic historical associations. Gibson chose a style and decorative elements for the courthouse and jail that allowed him to use his building material, brick, to the greatest advantage, while showing off his skill as a brickmaker and mason. Both the courthouse and jail have a medieval flavor in their basic gabled forms and the use of buttressing. This suggests the Romanesque Revival popular in the mid-19th century that borrowed from European medieval sources, the most prominent Texas example of which is the castellated General Land Office Building in Austin (1856-58, Conrad C. Stremme, National Register 1970). The Romanesque style experienced a second wave of popularity in the late 19th century stimulated by the work of H. H. Richardson. The style that came to be known as the Richardsonian Romanesque used the round-head arch and simple geometric massing in heavy masonry construction. While Richardson worked very innovatively in brick, he was known for his work in stone. His influence spread throughout the country in the mid to late 1880s. It is possible that Gibson was aware of Richardson’s design for Trinity Church in Boston (1872-1877) that was widely acclaimed. Here Richardson used the gabled form, Romanesque arches ,and tourelles that were adopted by Gibson in the Shelby County Courthouse; but it is also possible that Gibson simply borrowed these forms from patternbooks and other publications available to him. Gibson’s Shelby County Courthouse design suggests a Victorian East hectic at work, not yet influenced by Richardsonian Romanesque design. The complex facades of arcades, buttresses, tourelles, corbeled cornices, and the segmental arched porticoes and hood molds are most closely associated with the Victorian Romanesque and Victorian Gothic styles. Perhaps the closest parallel to Gibson’s design was in the contemporaneous or subsequent work of Nicholas J. Clayton, a prominent architect working in Galveston. In the Sacred Heart Church of 1884 (demolished in the early l900’s) Clayton used tourelles, groupings of tall, narrow round-head arches, and decorative brickwork similar to that of the Shelby County Courthouse. In his design for the University of Texas School of Medicine Building of 1889, Clayton again used these forms. The design of the tourelles around the projecting porch of the School of Medicine closely, echoes the pattern of Gibson’s Shelby County Courthouse of five years earlier. Both architects worked in brick, the most readily available material in their cities, and their designs used formed bricks and decorative brickwork to maximum effect. The modest size and monochromatic finishes of the Shelby County Courthouse make it appear slightly naive or retardataire in comparison to its more exuberant contemporaries of the Victorian Romanesque and Richardsonian Romanesque genres. Nonetheless, the common influences are apparent, suggesting that Gibson was influenced by national architectural trends, probably through the professional literature and builders patternbooks of the period. The Shelby County Courthouse and Jail are the only known surviving works by Gibson. His only other known design, for the Panola County Courthouse (1885, demolished 1955), was very similar to the Shelby County Courthouse. Bids for construction of the courthouse and jail were opened on April 8, 1884. J.J.E. Gibson won the contract for the courthouse at $26,725 and J.F. Barnes was given the contract for the jail at $8,580. Barnes was later joined by a partner named Hull. The commissioners required Gibson to superintend the construction of the jail as well as the courthouse. The Courthouse was built at the center of the square with an entry facing each cardinal direction. The jail was built at the northwest corner of the square adjacent to an earlier jail, without concern for any formal planning principles. Both buildings were essentially completed by the summer of 1885. The placement of the jail on the square with the Courthouse set a precedent for public buildings constructed in Center in subsequent years. The typical Texas courthouse square is dominated by a large courthouse of formal design without extensive grounds around it; the jail and other auxiliary buildings are a block or off the square. In rebuilding its jail adjacent to the 1885 courthouse, Shelby County perpetuated an earlier tradition of frontier communities when small, utilitarian government buildings were grouped together on the public square. Since Shelby County chose to build a relatively small courthouse in 1885 and had platted an unusually large courthouse square, the local governments had plenty of room to continue to build on the square. Later construction was not limited to county buildings but included municipal functions and services, such as the water towers and the fire station. By the early 20th century when the county planned the construction of an annex to augment the small courthouse, architectural tastes had moved away from Victorian eclecticism. The Classical Revival style had gained national prominence from the Worlds Columbian Exposition of 1893 and was widely embraced for the construction of public buildings. The Shelby County Records Building of 1913, designed by Smith and Barthel, Architects, used subdued details of the Classical Revival style while respecting its earlier neighbors in form, scale and materials. Of more concern to the county commissioners was that the building be fireproof, and the contract with the builders, L.R. Wright & Company, specified metal doors and windows, wire glass, hollow tile partitions on both the first and second floors, reinforced beams for the second floor, and a concrete stairway with iron newels and balustrades. The town’s fire station has been on the square since about 1908 when the Volunteer Fire Department was organized. Sanborn maps show the original building to be on the west side of the square, just north of the iron water tower that was probably in conjunction with the station. This fire station was replaced in 1933 by the present station, which has been altered over the years. For many years the “southwest corner of the square was the site of the town’s water towers. The Sanborn Map of 1912 indicated that there were two water towers side by side: an older 50-foot wooden tower and a the 72-foot iron tower mentioned above. The wooden water tower had been removed by 1924 when the next Sanborn Map was done. The iron water tower remained on the square until the 1980s. As in most county seats, the courthouse square was the social epicenter of the town. In the 1920s bands regularly performed concerts on the square and the local paper editorialized, “The worth of a good band to a town is untold. It cannot be estimated . . . it is a splendid development for the young men of the town in the musical line.” In the summer of 1923 the citizenry donated cash, paint, and roofing materials to build a bandstand on the east side of the square. The completed structure was square in plan, brick up to six feet with brick piers at the corners supporting a low roof with broad eaves. It echoed the design of contemporaneous bungalows influenced by the Arts & Crafts Movement. 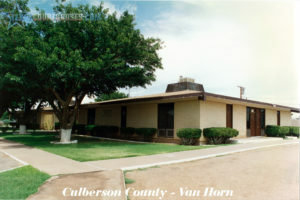 The structure was raised and altered in 1945 at the time that the current women’s restroom building was constructed. The Shelby County Courthouse Square complex is unusual in several ways. The platted square is large, while the courthouse is relatively small, being simply the focal point of several city and county functions contained on the square. The Courthouse and jail are distinctive examples of Romanesque Revival architecture and unusual in the context of Texas courthouses of the period. The Shelby County Courthouse Square and its buildings break rather than echo the design traditions of their time, and they are significant as one Texas community’s distinctive vision of what their public buildings should be.